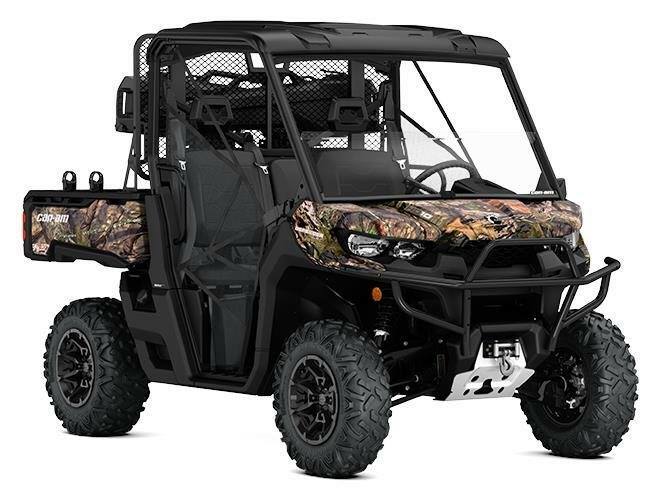 ADVANCES VERSA-PRO BENCH SEAT:The VERSA-PRO bench seat offered on the Mossy Oak Hunting Edition package includes a reinforced seat cover. It uses a thicker vinyl and a special material finish to be more resistant and offer a premium look. The Defender vehicles’ high-quality seat cover is designed to endure the everyday use on the farm, job site and trail. In addition, the VERSA-PRO bench seat comes with a 3-in (8 cm) adjustable driver’s seat (forward/rearward) for added comfort and better ingress/egress. POWERFUL WINCH: Can-Am chose a premium winch kit for the ultimate performance and durability. The 4,500-lb winch includes dash control and roller fairlead. LARGEST HOLDING CAPACITY: The Double Kolpin Stronghold Gun Boots features the largest holding capacity of all Kolpin Gun Boot cases while the removable foam and nylon Impact liner ensure a superior interior protection. Easily fits firearms up to 52-in. (132,1 cm) in total length with room for optics and bipods. Secures to mount in seconds with auto-latch feature. The holders are durable, flexible grips and cushion padded to protect while providing a custom fit for a variety of items 1-in. to 4-in. (2.5 cm to 10 cm).